Imagery and propaganda were used by both those for and opposed to suffrage. election day! library of congress. Throughout much of the nineteenth century, opponents of suffrage created numerous cartoons that mocked suffragists. In 1894, the magazine Puck published this cartoon of a woman at the polls. She can’t fit into the polling booth because of her dress. 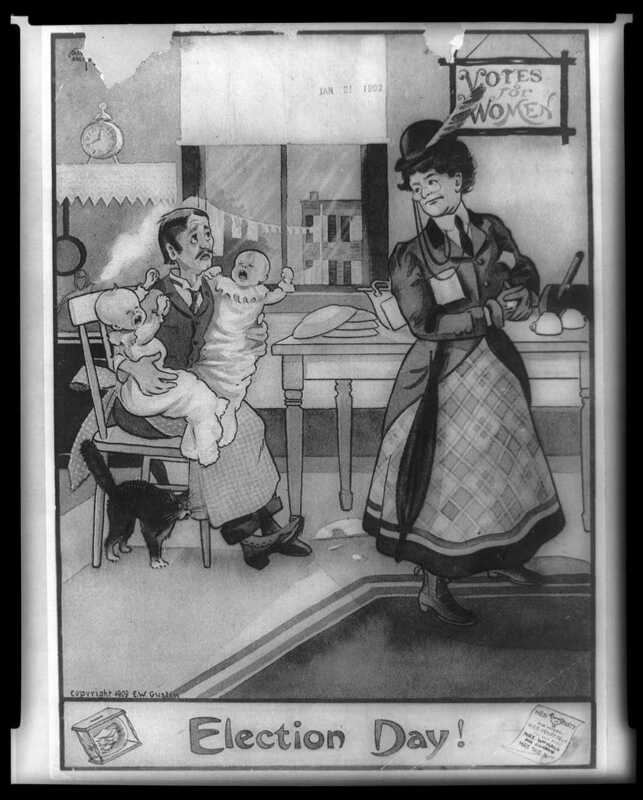 The caption reads: “How can she vote, when the fashions are so wide, and the voting booths are so narrow?” The cartoon suggests women care far more about frivolous and fashionable clothing than about practical matters like voting. After nearly a century of imagery mocking political women, suffragists organized a response in the late nineteenth century. The National American Woman Suffrage Association (NAWSA) created press committees, art publicity committees, and employed professional publicity managers. They hired artists to make images for posters and postcards. Photographs of suffragist mothers were placed in newspapers to convince the public that women could be good mothers as well as voters. When the National Woman’s Party (NWP) broke with NAWSA, the NWP continued NAWSA’s coordination with the press and even hired NAWSA’s publicity manager. NWP leader Alice Paul ensured that photographers documented their pickets and arrests. Suffragists’ coordinated use of visual propaganda and publicity tactics helped to change the tide in their favor. In 1915, editors of Puck—the same magazine that had published anti-suffrage cartoons for decades—declared the magazine in favor of suffrage. They even printed an entire issue of pro-suffrage cartoons in February 1915. The significance of imagery and propaganda in the suffrage movement demonstrates the growing importance of publicity campaigns for politics and social movements at that time. What role did imagery play in the suffrage movement? How did the movement's leaders use propaganda to persuade people to their cause? How did anti-suffrage leaders use imagery and propaganda to make the opposite point? Throughout the American Suffrage Movement two major color themes were used. Gold, like on this sash, was first used by Elizabeth Cady Stanton and Susan B. Anthony while campaigning for suffrage in Kansas. The women adopted the Kansas state symbol, the sunflower, to represent their cause. Gold pins, ribbons, sashes, and yellow roses were worn to show support for suffrage. The other color theme, more common with the British Suffrage Movement, was purple, white, and green. Oftentimes in the United States the green was replaced with gold. Supporters also worn buttons, ribbons, and sashes in these colors to show their support. A political cartoon from Puck that shows a woman unable to fit into the polling booth. This political cartoon, published in Puck, shows the mascot of suffrage. Suffragists from the National Woman’s Party made smaller versions of the banner used on the 1913 parade’s first float. These "Great Demand" banners were used in demonstrations and rallies and at suffrage headquarters. Marie Gilmer Louthan carried this one in suffrage parades. Photo taken in front of the Treasury Building at the Woman Suffrage parade held in Washington, D.C., March 3, 1913. A suffragist holds a banner quoting one of President Wilson's speeches: "We Shall Fight for the Things We Have Always Carried Nearest Our Hearts, For Democracy. For The Right of Those Who Submit To Authority To Have A Voice In Their Own Governments." Artist Nina Allender was the official cartoonist for the National Woman's Party. Luciille Angiel Calmes received this Jailed for Freedom pin, a small silver prison door with a heart-shaped lock, after she was arrested and sentenced to five days in a District of Columbia jail for participating in a watch fire demonstration on January 13, 1919. The watch fires of freedom marked a return of woman suffrage pickets to the White House. They burned copies of President Woodrow Wilson's speeches in small cauldrons, calling attention to the hypocrisy of his touting democratic principles abroad while he refusing secure the Senate votes needed to pass the woman suffrage amendment.